I’m sitting curled up on the sofa with my laptop, staring into the fireplace, and contemplating logs. I need to some bring in. I love our fireplace. It is huge. Once it was the only source of heat for the centre of the house. (Our house was once 3 one-up-one-downs for farm workers, and they got made in to one house sometime after the Second World War, with a bit of infill and add-ons in odd directions to give things like a bathroom, a staircase, and a loo.) The fireplace was where the middle cottager cooked, heated water, and made bread in a little brick oven off to the right. We still cook on the fire every couple of weeks or so in winter, just for fun really. I can stand up inside it, stretch out my arms and not touch the sides. It basically takes up an entire wall. Of course the downside of such a fireplace is that it is unbelievably cold in that room in winter, if the fire isn’t lit. Cold air plummets down the chimney and into the room unimpeded. So we burn a heck of a lot of logs. Getting them isn’t a problem, there are lots of people around here doing logs, lots of small woods, and lots of tree surgeons, so with a bit of asking around we can always get some at an ok price. We stack them along the wall on the lee-side of the house, and the jutting roof protects them from most of the rain. The real blighter is getting them all in the house. With a back injury it is not a straightforward matter to carry them in, and him indoors is in fact rarely indoors here because he is working very hard elsewhere, with a tough commute either side. So I have developed the not-patented-log-into-house-transference system. This involves a narrow wheelbarrow, two small wooden ramps (one up to the little terrace in front of the door, one into the door), sections of Turtlemat end-to-end for carpet protection, and a robust attitude towards banged walls and furniture. I load up the barrow, push it around the house, onto the terrace, into the door, wiggle it round the bend into the room with the fireplace, over the turtlemat, and up end the lot into the hearth. 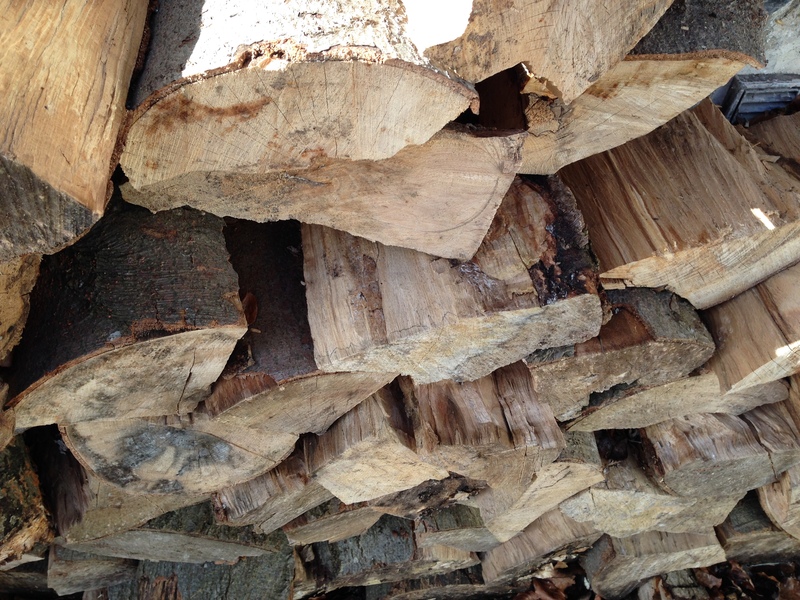 Once the first load is stacked either side of the fire grate, it’s back to the log pile to do it all again. With a bit of care I can do a five barrow stack inside, which lasts us long enough to make the whole palaver vaguely worthwhile. Some people have found it a little odd, seeing me push a wheelbarrow through the living room, but it works, is pretty quick, and it doesn’t aggravate my back, so frankly it’s a win on every front. Maybe I should try it for the shopping.